Graham Edwards Trailers manufacture and sell commercial and livestock trailers and trailer parts with stockists all over the UK. They have over 20 years experience in the trailer manufacturing business and are renowned and respected for the level of service they provide. They pride themselves on their high quality workmanship, producing strong and durable trailers that their clients know they can trust. Graham Edwards Trailers create a wide range of livestock trailers and containers to suit all needs. Their trailers are built to order, ranging in size for all uses and can be customised to any specific requirements if requested. Whether you’re in the market for a cattle trailer, sheep trailer or livestock trailer for any other type of animal, Graham Edwards Trailers have new and used livestock trailers for sale so you can be sure to find what you’re looking for. ATV trailers for transporting a few livestock or other produce over rough terrain are also available up to 750kg. 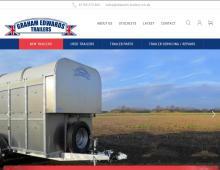 As well as livestock trailers Graham Edwards Trailers also manufacture commercial trailers. If you require a plant trailer, flatbed trailer, tipping trailer or car transport trailer they can meet your needs. Each trailer comes with many features as standard, however there are additional extras available to customise your trailer to exactly fit your own requirements. Looking for plant trailers for sale, flatbed trailers for sale or any other type of commercial trailer? Graham Edwards Trailers are the trailer specialists to call today. As well as new trailers, Graham Edwards also stock a selection of used trailers for sale. Purchasing a brand new trailer might not be cost effective for your business at the present time, so Graham Edwards Trailers offer good quality used livestock trailers for customers on a budget. Graham Edwards Trailers offer trailer servicing in York. With highly trained and experienced trailer servicing experts, they can ensure your trailer is in good working order, minimise the risk of failure and help extend its lifespan, giving you peace of mind and allowing you to get the most out of your trailer. They also offer trailer repair in York for those unfortunate situations in which your trailer becomes damaged. They have all kinds of trailer parts and trailer spares such as trailer wheels, trailer brakes, trailer axles and anything else that may be required, giving them all the resources they need to bring your trailer back to working order. Should you be worried about the condition of your trailer, Graham Edwards Trailers in York offer NTTA QS Free Safety Checks for any trailer up to 3500kg (gross weight). This will flag up any trailer repairs that should be done. If you’re looking for sheep or cattle trailers for sale or any other type of livestock or commercial trailer, contact Graham Edwards Trailers today. With a wide range of new and used trailers for sale you can be sure they can meet all of your trailer needs.